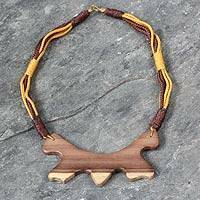 By Robert Aidoo-Taylor, this beautiful necklace features a pendant carved from African oprono wood. It centers a necklace knotted by hand of brown and yellow cords. By Robert Aidoo-Taylor, this elegant necklace is named for the vibrant community of Sempe in Accra. 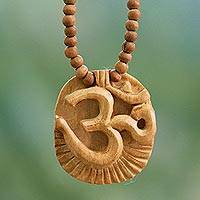 The pendant is carved from African oprono wood, and worn in a necklace, braided by hand. Thailand's Pornpimon reclaims mango wood for the exquisite design of this necklace. 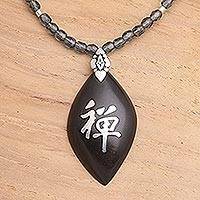 The disc pendant is in harmonious contrast with silver at the center of a leather cord.